Longtime local artist Eugene Sargent has once again added to his legacy of creating public art in Fayetteville. Sargent is the sculptor behind the 45-foot worm and the unique benches near the castle at Wilson Park, the giant locomotive at the Botanical Garden of the Ozarks, the unique doors at Bordinos on Dickson Street, and countless other interesting works around town. This past weekend he installed his latest creation just on the western border of Fayetteville. His latest creation? 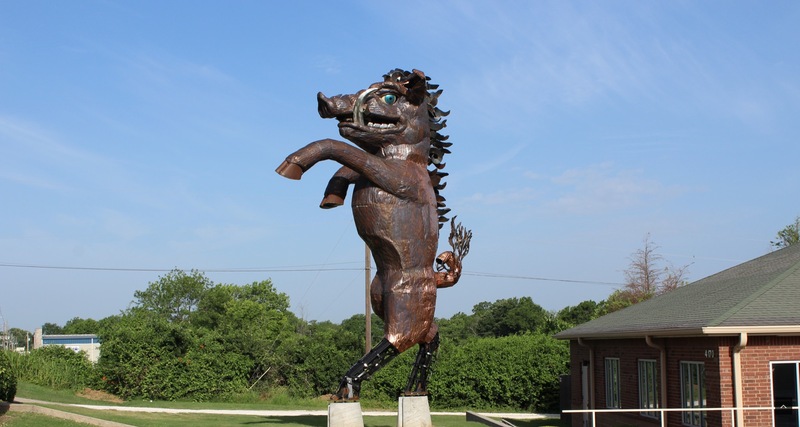 “Hogeye,” a nearly 30-foot-tall dancing boar located across from the Ozark Mountain Smokehouse on Highway 62. 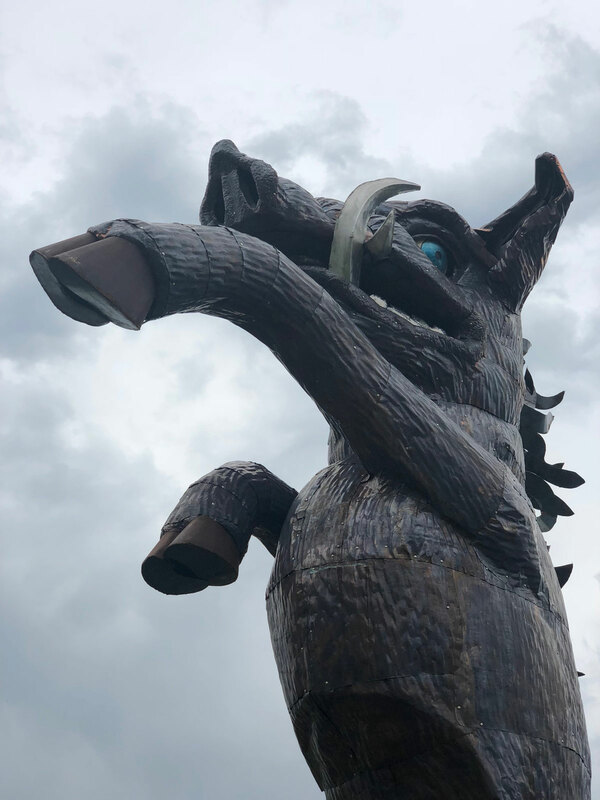 The sculpture was commissioned by local business owners Cliff and Niki Slinkard of longtime local promotional products company, Hogeye Inc.
Cliff said he was considering installing a standard business sign, but settled on a more creative idea. 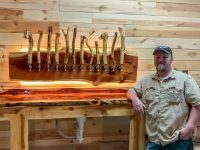 “I was originally looking to get a new sign for our business, but decided it would be neat to have a unique artistic landmark instead,” Cliff said. 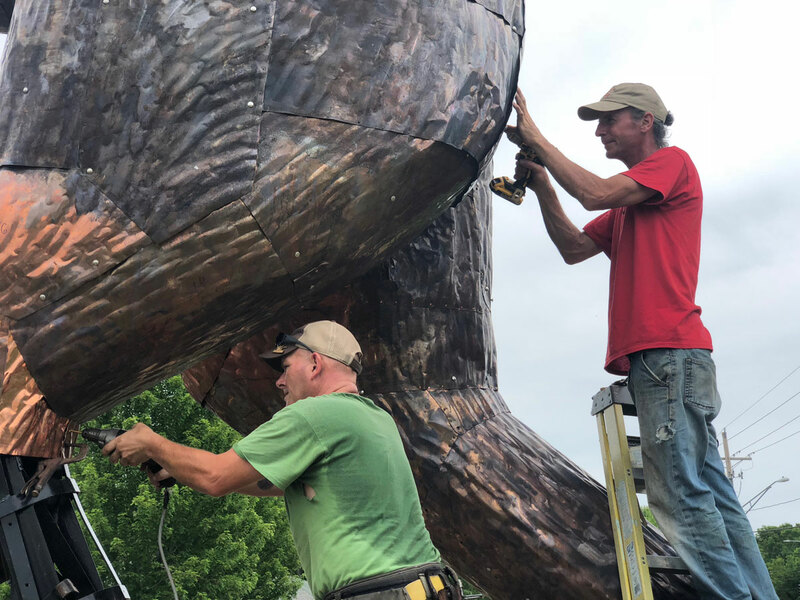 The Slinkards enlisted the help of Sargent, who constructed the statue at his rural Washington County studio, and installed it in its new home over the weekend. The design is based on the Hogeye Inc. logo, though Sargent’s design depicts the boar on its back legs, with its front feet pawing the air as if it were dancing. The statue was prototyped to scale, with each numbered section carefully sketched and planned before the final build began. 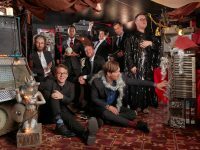 All together, the project took nearly a year to complete. Sargent was still putting the finishing touches on the statue early Tuesday, including some features of the hog’s feet, and lighting. Now that the sculpture is in place, the Slinkards are hoping the local community will embrace it. This article is sponsored by First Security Bank. 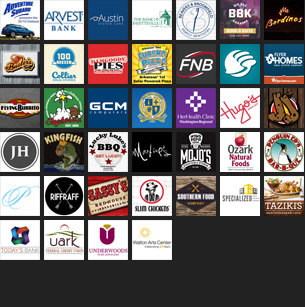 For more great stories of Arkansas food, travel, sports, music and more, visit onlyinark.com.